Rosamund of Islington, vampiric ambassador from the Courts of Love, returns to the haven of the German Ventrue Lord Jurgen with harsh tidings. An enraged ancient is in her company and demands shelter at the Ventrue court. Soon he is usurping Jurgen's ambitions to conquer Livonia and to make Rosamund his queen. Can the Toreador ambassador negotiate the troubled waters between these warring lords, or will her own passions doom her? 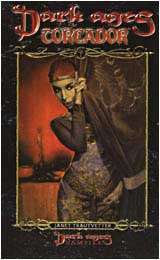 Janet Trautvetter is a contributor to many supplements in the Dark Ages and Vampire: The Masquerade game lines, including Dark Ages: Inquisitor and Archons and Templars.